China's first gay pride festival has been praised in the state media in a significant shift from the previous attitude to such events. The festival was described in the China Daily newspaper as an event of "profound significance" and a "showcase of the country's social progress". Film screenings, discussions and parties are being held as part of the week long festival in Shanghai. 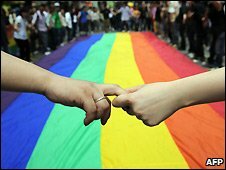 Homosexuality was officially labelled a mental illness in China until 2001. Before Shanghai's Gay Pride Festival got underway, the organisers were worried it might get shut down. They were warned by a lawyer not to hold a parade, for fear that it might be seen by the authorities as a protest. Instead they decided to organise a week of activities in private venues. That low-key approach seems to have worked. The China Daily has carried a large front-page article about the event and about homosexuality in the country. An editorial inside says the festival shows how Shanghai, what it calls "one of the most open and progressive Chinese cities", has displayed acceptance and tolerance by allowing the festival to take place. In the past the official attitude to homosexuality in China might best be characterised as "don't condemn, don't promote". The fulsome praise the paper lavishes on the festival, its organisers and on the city of Shanghai, has not been seen before in the official media. The paper acknowledges that in rural areas especially homosexuality is seen as a taboo or an affliction. It says there is still a lot to be done by the government and the country's media to promote acceptance and respect of the China's lesbians and gays.